If you live in a cold climate and are interested in knitting, mitten instructions will appeal to you. Mittens are relatively small projects. Depending on the design and type of yarn selected, you can often complete them very quickly. An experienced knitter can probably expect to spend one evening on a simple mitten. Mittens are normally made using a set of sock needles, which are pointed on both ends. Choose the size according to pattern instructions or to obtain the gauge required. Select yarn for your project based on the pattern and on the color and texture of the mittens. Many patterns specify the kind of yarn, rather than a specific brand of yarn. Patterns at a yarn company website do, of course, specify yarns from that company. Yarn for mittens can be bulky, worsted, or sport weight, depending on the desired weight of the mittens. Very fine yarn is very rarely used for mittens, since it does not supply much warmth. You'll need stitch markers to mark the ends of rows, because you will normally be knitting in the round. Mitten patterns are available for adults and children. Mittens can have short or long cuffs, and they can also be fingerless, leaving the wearer's fingers free and keeping the wrists and palms warm. 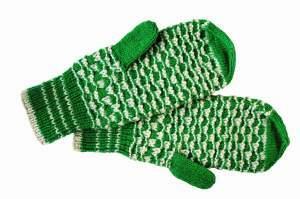 Kids' mittens sometimes have a knitted cord attached to the wrist of each mitten so that the child can keep the mittens together. You or your child can thread this cord through the sleeves of a winter coat or jacket, assuring that the mittens stay with the coat. Mittens can be a single color, be striped, or have a complex pattern. Traditional patterns, such as argyle and Scandinavian folk images, are also popular. You can find knitting patterns for mittens from several sources. Books and pamphlets on knitting are available from local bookstores, online bookstores, yarn stores, and craft stores; many of these also contain mitten patterns. In addition, a number of knitting websites have free patterns or patterns that can be downloaded for a small fee. A few patterns of each type are listed below. An Internet search will elicit many additional patterns, as will a search of bookstore sites or browsing in brick and mortar craft or yarn stores. Advanced knitters may wish to make their own patterns by drawing a template. You can do this by tracing the prospective recipient's hand. Start at the tip of the mitten, and use sock needles. You can also add a ribbed cuff. The number of stitches at the tip and the rate at which they are increased as you knit the mittens will determine how pointed the completed mitten will be. You should make note of the number of rows and the number of stitches in each row, so you can make the second mitten the same way. When knitting mittens, you should carefully follow any instructions. It's helpful to have a gauge swatch with the needle gauge and yarn type recommended; this assures you that the finished mittens will be neither too small nor too large. Most mitten patterns use standard abbreviations, and you should familiarize yourself with all of the abbreviations used in the pattern before starting to knit. It's also important that you select a pattern appropriate for your level of knitting experience, although it can be a learning experience to "stretch" just a bit to the next level. Experienced knitters may wish to experiment with making their own hand templates to knit mittens. Less experienced knitters can take advantage of the large number of mitten patterns available for free or for a very small price. Experienced knitters may also want to try some of the more complex and patterned mittens that are available on the Internet and in books. There are so many mitten styles available for both children and adults that with a bit of searching, you can find suitable knitting mitten instructions for any skill level.